Today I had the pleasure of fishing with a new buddy, Ken, with whom I connected via the Southeast Fly Fishing Forum (despite the fact that he lives but a few short miles from me). Ken is a veteran western trout fisherman who’s casting is graceful and wonderfully accurate, all the more impressive considering he was using an unfamiliar rod and throwing brick-like 1/0 bass flies instead of his usual diminutive #20 olive duns. I envy that proficiency and I suspect that 95% of the time, he’ll be schooling me, big time. But today we were on my turf, chasing largemouths in the Haw, so I was the guide. Scary. The water level was darn near perfect, but the river was murkier than I'd like, mostly because it made wading a bit trickier than normal. (But who do you guess got wet, me or Ken the first timer?) 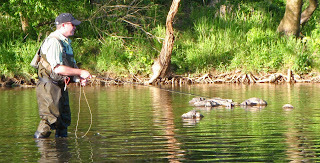 We started mid-afternoon with a high sun and clear skies that had chased the largies into the shadows and deeper pools. It took a while to find them, but as the day drew longer we caught half-a-dozen nice bass, 10-17 inches, mostly on gulley fish, with a couple tossed in on a Murray’s Marauder. The fish we're catching in the Haw right now are really nice, strong and big compared to last year. I like it. Thanks for a fine trip, Ken. Let’s do it again sometime soon. Great trip, Mike. Thanks. You were a great guide!. Your description of my casting is over-generous though.